The Instant Pot is great for so many things: my favorites are risotto, mashed potatoes, short ribs, and steel cut oats. And now, cheesecake. That's right, you can make cheesecake in your pressure cooker, and it turns out wonderfully! It is so creamy! I dislike heavy, dry cheesecake, and this one is anything but! All the steam inside the pressure cooker guarantees the perfect texture. There are so many adaptations you could make to this basic recipe. You could add a fruit topping, chocolate ganache, salted caramel sauce, the possibilities are endless. 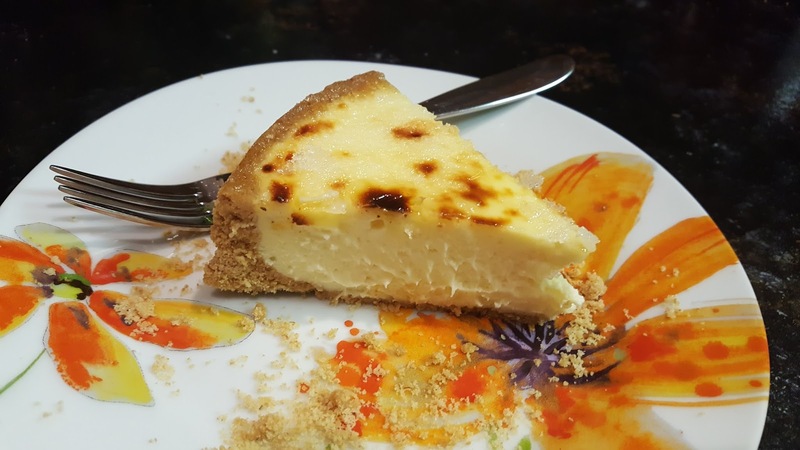 I did a creme brulee topping, which you add after the cheesecake has been removed from the pressure cooker and cooled a bit. You could also make individual cheesecakes in custard cups or silicone muffin cups. 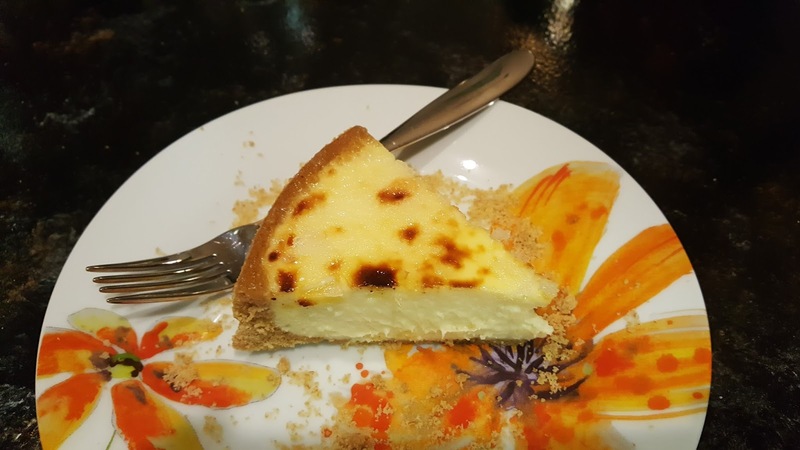 Because of the build up of steam, you probably will end up with some water on top of the cheesecake, especially where the crust meets the filling. Simply dab a paper towel around the edges, and it will soak up all the water. If you line your pan (both bottom and sides) with parchment, that may help as well. A note about pans: I have a springform pan that is just under 8 inches and it fits in my 6 quart Instant Pot. Most recipes call for a 6" pan which would likely sit on the trivet inside the pot; mine fits snugly near the top. 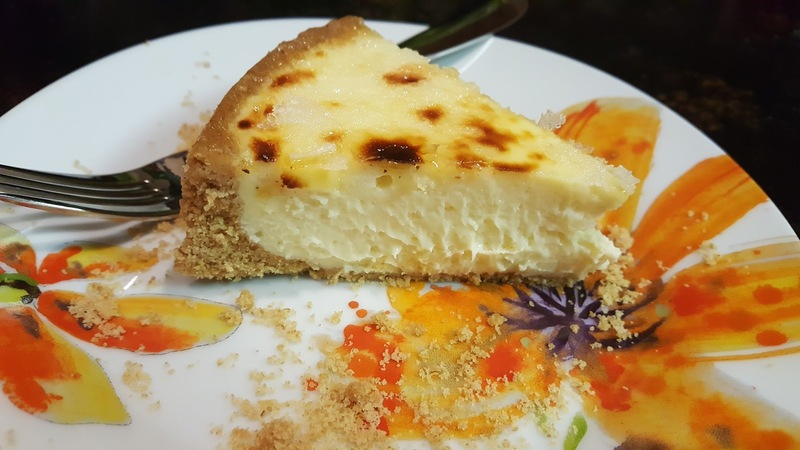 You may need to adjust the cooking time slightly if your pan is smaller, because your cheesecake will be deeper. The great thing is, you can experiment and make this recipe several times until you get it perfect. And you can eat all the trial runs...with different toppings. Get more great ideas at Inspiration Monday, Inspire Me Monday, Busy Monday, Inspire Me 2, Fabulous, Show and Share, Hearth and Soul, Wow Me, Wow Us, Whisk It, Full Plate, Party. Bake at 325 for 15 minutes or until golden. Let cool slightly. In a large mixing bowl, use an electric mixer to beat the cream cheese until fluffy. Add the eggs, one at a time, beating well after each addition. Then add the sugar, sour cream, cornstarch, vanilla and salt, and mix until well combined and very creamy. Pour the batter into the prepared crust. Place 1 cup of water in the bottom of an electric pressure cooker and insert the trivet. Fold aluminum foil to make a "sling" for your pan - you want the foil to go under the pan and up the sides. You'll need this to get the pan out later. Use the sling to insert the pan into the pressure cooker, then fold down the foil sides. Secure the lid, ensure the toggle knob is set to "sealing" and set for manual pressure for 26 minutes. When the cycle is completed, let the pressure release naturally. 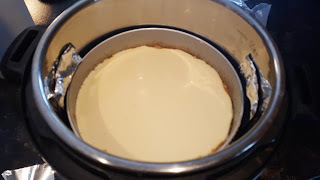 Remove the lid, being careful not to drip any of the accumulated water from the lid onto the cheesecake. Carefully remove the cake using the foil sling and transfer to a wire rack. Use a folded up paper towel to carefully dab away any water on the cheesecake. Let cool completely. Sprinkle with the sugar and then place under a broiler or use a hand torch to brown the top. Watch carefully if it's in your oven! Refrigerate for several hours to fully set. Serves 12. Oh that looks so yummy! Thank you! What a twist on Creme Brulee! I have to pass this recipe on to make daughter - she is the chef of the family, it might become a family favorite! I guess it's time for me to try a dessert in the Instant Pot! I'd love for you to share over at a new party called Let's Party https://themarkandjanshow.com/2018/02/07/lets-party-7/ ... we look forward to seeing you there!